On Windows operative systems it is possible to run the program as portable executable. Any extension (plugins, snippets, etc...) and setting will be set and loaded inside the folder that contains this executable. Existing installations of SMath Studio and other portable executables won't interact with it. As first step you have to download the right package. 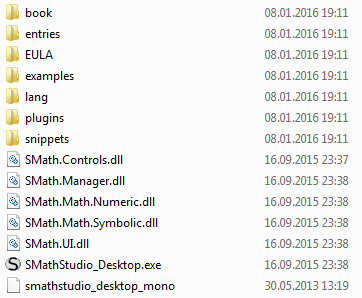 From the homepage download the one named SMath Studio Desktop for Mono. If you are looking for a previous version look into the history section. Once downloaded, unpack the archive where you want. Depending on your archive manager, you might have to do it twice. Into that folder create a new empty text file (*.txt), and call it "portable.version"; you must have the "Hide extensions for known file types" option of your OS disabled. That's all! 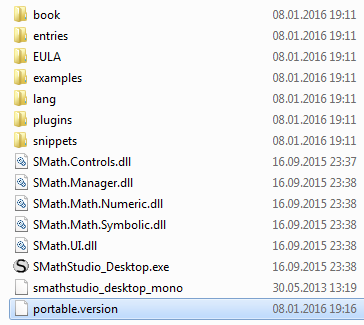 Once you run the executable in that folder, you should notice the program version on the title bar and the "portable" attribute in the Help > About SMath Studio dialog. For some time there used to be an official SMath Studio Desktop Portable executable associated with SMath Studio releases. That was made in the scope to have a full portable version that didn't need .NET Framework installed on the target machine. This it is now discontinued; since the creation of those packages was made using a commercial virtualization software, it is possible that some or all these packages won't works anymore.